I'm sorry for the light (and late) posting today. I was going to pre-post this, but I ran out of time last night (well, this morning), so will have to play catch up. No links right now - a lot of our partners made announcements today, though, and I'll do my best to pull them in soon. 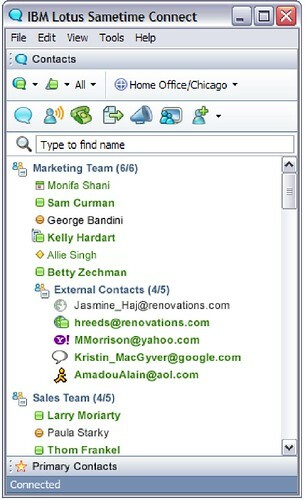 For our part, we announced this morning that we will be releasing Lotus Sametime 7.5.1 in early 2Q 2007, and are also using this opportunity at Lotusphere to focus very heavily on explaining our Unified Communications and Collaboration vision and strategy. 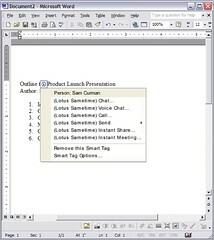 Point-to-point video We will include free point-to-point video as part of the out-of-the-box Sametime instant messaging client. Also, as several of our partners have announced today or over the past few days, we will continue to offer multi-way video through our video partners. Microsoft Integration. Users will be able to start IM conversations, Sametime VoIP calls, and Web conferences from Microsoft Office and Microsoft Outlook. Mac client. 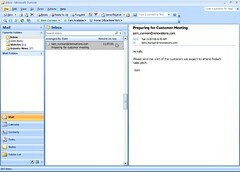 We will deliver a Sametime 7.5.1 client for the Mac. We will also be supporting Mac participation in a Web conference (Mac users will not be able to share applications, though). 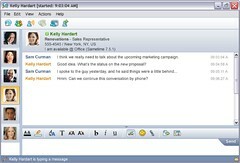 There's a lot more one level down from here, too - new languages, new policies, a new embedded browser for the chat conversations, additional functionality around sending chat transcripts as e-mail, support for Unix file conversions for Web conferences, and more. I'll post more about Unified Communications and Collaboration after the keynote tomorrow.